In honor of Julia Child's birthday, I made a recipe that came from the TV series Baking With Julia. It’s a Nectarine Upside-Down Chiffon Cake, a simple recipe that suited Julia’s taste perfectly. Nothing too over-the-top, just a simple cake made with deliciously ripe nectarines and a layer of almond streusel. From Baking With Julia (Morrow, 1996; recipe contributed by Mary Bergin). Recipe & photo compliments of Tish Boyle. 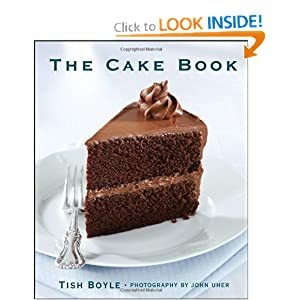 Order Tish's "The Cake Book"
1. Preheat oven to 350°F. Cut the butter into 3 or 4 chunks and toss them into a 10-inch diameter sprinform pan that’s 3 inches high. Place the pan directly over medium-low heat and melt the butter, tilting the pan so that it covers the bottom evenly. Remove the pan from the heat and scatter the brown sugar evenly over the butter, patting it down with your fingertips. Arrange the nectarine pieces in concentric circles over the sugar. Wrap the bottom of the pan in aluminum foil to catch any butter that might drip during baking and set the pan aside. 2. Put the almonds on an ungreased baking sheet and bake them until fragrant, 10 to 15 minutes. Cool completely. 3. Line the baking sheet with parchment or a silicone baking mat. Put all of the streusel ingredients into the bowl of a food processor and pulse just to mix the ingredients and chop the almonds and butter. The mixture will be rough and crumbly. Spread the streusel out on the pan and bake for 10 to 15 minutes, stirring once or twice, until golden brown. Cool. Leave the oven on. 4. In a medium bowl, sift together 1 cup of the sugar, the flour, baking powder and baking soda. Whisk in the salt and set aside. 5. In a large bowl, whisk together the yolks, oil and lemon juice until blended. Gradually add the dry ingredients to the yolk mixture, whisking all the while; set aside. 6. Beat the 6 whites in the bowl of a mixer fitted with the whisk attachment. At low speed, beat the whites until they’re foamy and form very soft peaks. Increase the mixer speed to medium-high and gradually add the remaining ½ cup sugar, beating until the whites are thick and shiny and hold peaks. Fold about one-third of the whipped egg whites into the yolk mixture to lighten it, then turn the yolk mixture into the whites and fold it in gently but thoroughly. 7. Scrape half of the batter into the fruit-lined pan. Smooth the top, using an offset spatula, and sprinkle over the streusel, reserving a little for decorating the finished cake. Top with the remainder of the batter, smoothing it with the spatula, and place the pan on a baking sheet. Bake for 45 to 50 minutes, or until a toothpick inserted into the center comes out clean. Cool for at least 25 minutes before inverting it onto a cardboard cake round or cake plate. Serve with vanilla ice cream or whipped cream.